I was in Disney’s EPCOT theme park when I finally reached breaking point. I had just made it to the edge of a large lake and realised I had to walk all the way around it in the heat. I had previously been fortunate enough to go to the original, and more compact, Disneyland in California but most people who’d been to both Disneyland in California and Walt Disney World (WDW) in Florida insisted that WDW was better ‘because it was bigger’. At that moment I vowed to my friend in a crescendo-ing “The next person that tells me WDW is better because it’s bigger will get a broken nose!”. On another scorching day in Florida I went to Venice Beach to look for fossilised shark teeth. I removed my shoes as I got to the sand line, revealing my pearly white feet, and proceeded to walk the one hundred meters to the waters edge. About half way I abruptly discovered the sand was very hot. My casual “nothing to see here” walking turned into a frantic “Aussie tourist on fire! Get out of the way’’ dash to the water. I did collect several shark’s teeth that day, as well as an imaginary certificate for the achievement of making feet feel like they’re blistered without actually being blistered. On another trip to the US, this time the western side, I went to see the bizarreness of Las Vegas. When I arrived, it wasn’t like at all the pictures – at night and lit with colour. 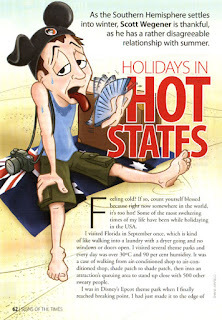 It was the middle of a 40oC+ day and I stepped out of the car into the middle of a big asphalt car park. I’m surprised my shoes didn’t set on fire immediately, or at least melt to the ground like butter in a hot pan! I never thought I’d ever say I was desperate to enter a casino, but there I was, grabbing the luggage and making a dash for it – as much as you can hauling three suitcases and two backpacks (I wasn’t coming out for a second trip!). I had been travelling in a mini van that didn’t appreciate the six people and luggage squeezed into it. While it did have air conditioning, it struggled so much on the hills that we had to turn the AC off for every inclination of an incline. If you do plan on visiting US deserts in summer – make sure that . . . actually. . . . Just don’t do it! Let me explain. I was excited to visit the Grand Canyon and see how massive it is. You have to see it to comprehend it – just like Uluru (another hot place). The problem was that the heat was so stifling that I had to sprint to the edge, take a photo and sprint back to the air-conditioned car before my clothing set alight. I vowed never to visit the Grand Canyon again in summer – and, as so happened, the second opportunity to visit was in winter. Good idea, right? NOPE! It was so cold that I again had to literally run out of the car to take a photo and run back again before my clothing started to snap off! I’ve since discovered this radical temperature change is similar to the moon’s. I always thought the moon was a cold place. And I am half right. The dark parts of the moon drop to -233°C but where the moon is lit up, the temperature rises to 123°C. I’m sure the day I get to the moon my space suit’s AC won’t be working. But I’m prepared now. I’ve been to Florida in September!